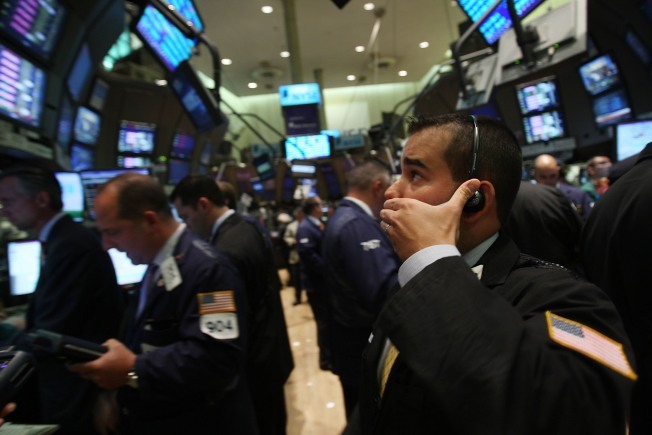 The Dow fell 187.13, or 2.1 percent, to 8,612.13 after falling as much as 221. The broader Standard & Poor's 500 index fell 22.49, or 2.4 percent, to 923.72, and the Nasdaq composite index fell 42.42, or 2.3 percent, to 1,816.38. Investors are back to selling stocks after running short of reasons to keep the market's rally going. Major stock market indexes fell more than 2 percent Monday, including the Dow Jones industrial average, which lost 187 points. It was the biggest drop for the Dow since April 20. Trading volume was light, suggesting an absence of buyers rather than a flood of sellers rushing to dump stocks. The slide began in Asia and Europe and spread to the U.S. as a strong dollar pushed commodities prices sharply lower. Stocks of energy and materials producers have been lifting the market in the past month so the drop in prices left stocks without an important leg of support. Traders said the dollar rose against other most other major currencies following comments from Russia's finance minister that the greenback likely would remain the world's reserve currency. Investors have been worried in recent weeks that foreign governments would seek to spread their holdings beyond the dollar. That would cut into demand for the currency. Commodities including oil tend to be a hedge against a weak dollar. So, when the greenback is stronger, investors feel less need to protect themselves against it and they start selling commodities. That in turn tends to pull down the stocks of basic materials producers who profit from higher prices. Analysts said stocks are also losing ground because investors are questioning what it will take to move the market higher. Ahead of Monday's slide, the Standard & Poor's index had jumped 39.9 percent since skidding to a 12-year low on March 9. Investors have been betting on an economic recovery but questions about how long that might take are poking holes in the rally.